Making healthy homemade dog treats is, in my humble opinion, part of Anti Aging! Having healthy happy dogs who live many years, disease free, and happy helps keep us young too! I can make organic dog treats by using my favorite dog treat recipe! I control all the ingredients and can be assured they are organic and healthy for our beloved critters! They smell so good that my husband and I chew on them from time to time! I love giving organic homemade dog treats as gifts to friends; for their dog's birthdays, for holidays, or just for fun! Everyone really appreciates them! After making my first batch of homemade dog treats, all by hand, I decided to look for a used Kitchenaid Mixer with a dough hook, and boy has that paid off -- I broke both my wrists in 2002, and after a lot of kneading they get too tired. Voila, let a machine do the work!! For years I have wanted to buy a kitchenaid mixer, a RED one... My used is white, but it will do just fine for now, thank you! You can find all the ingredients at any health food store. I keep my eye out for sales on Organic Beef and Chicken Broth, cheese, flour etc. I can make several batches and store them; this way I only do the work once every couple of months. Two flours that I have been using more are Quinoa and Amaranth. We have been eating some great Organic Cereals from Canada with these grains, and I just read an article about some special Super Cookies made in Utah at BYU for starving children around the world...they are using Quinoa for it's excellent nutritive value! I also recommend using 1/2 cup or more of soy baking ''flour,'' another superior nutrition ingredient! So Mix & Match as you desire, and ENJOY these great Homemade Dog Treats!!! In your Kitchen Aid or other food processor, mix together all the ingredients except the flour. When it is completely mixed, start adding the flour a little at a time. Knead 3 or 4 minutes, adding more flour if necessary to make a very stiff dough. Grease a LARGE baking sheet, place a big ball of dough in the center, and start rolling out with a rolling pin, until about 1/4-1/2 inch thick. What i found works the very best, is a Pizza Cutter! You can make the treats as small or big as you want. I usually cut in such a way that i have a big variety of sizes. IF you want, you can use cookie cutters for fun shapes, but this is so time consuming and a big hassle, and the dogs don't care one way or other what they look like---ugly treats are just as yummy!!!! Bake for 1 hour at 300 degrees. Turn off heat and leave in oven for 1 1/2 hours--- or longer, which I have found to be the best. If the dough is too thick, it will not get as crispy, and the treats may go bad faster. Sometimes I turn the entire sheet of treats over and let the bottom side dry out well too. In general, store dog treats the same way you would homemade people cookies. The amount and type of fat in the recipe and your local weather conditions can make a big difference in storage method. If your recipe uses fats such as butter, or meat bits or juices then you might want to store the spares in the fridge or even the freezer. I keep a good supply in the Doggie Cookie Jar on the counter and re fill from the ones I have stored. Refrigeration will prolong the life of more fragile dog treats. Make sure to store in a tightly sealed container---my favorite containers are ones you can use over and over again. If you have friends who eat Shaklee Instant Protein etc, ask for their spare containers; they are amazing for storing homemade dog treats in the fridge!! I also have bought Lock N Lock containers, which are flatter and square, and are more efficient for freezer space. Some dogs love frozen treats, the way some love eating ice cubes. So for a special treat, especially in the hot weather, a frozen homemade dog treat can be a really plus!! You can find other recipes for homemade dog treats online, or make up your own!!! I have found that dogs love any treat you give them, since they are being given in Love by their Humans!!!! 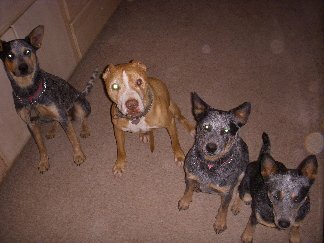 Patterson, Chile Pepper, Toomba, & Zahdy love their homemade dog treats, and will sit for a very long time in anticipation--- great training bribe!!!! See this page on Squidoo! To my sweet hubby's consternation, the cooking jar is now a Doggie Cookie Jar! !